When it comes to Bethesda Softworks, the company that Elder Scrolls built has hits. The announcements and demos show that next year will be a noteworthy one for fans of their catalog of games. Here are a few of the highlights from Sunday night’s showcase to get you up to speed on what’s to come. While leaks may have spoiled the announcement of Rage 2, Bethesda still had plenty to show. Unfortunately, for many in attendance and watching online from home, they had to sit through a bit of an awkward live rock performance before any of it was shown. However, once the gameplay demo started, gamers were treated to a glimpse of the high-octane drives through apocalyptic dirt roads, mutants and all the shoot ‘em up action you could ask for. Doom brought the franchise back in all its demon-killing glory back in 2016. Yesterday, Bethesda gave us a tease of the follow-up: Doom Eternal. The trailer doesn’t give us much to go on except a hellish landscape, demons and the return of everyone’s favorite Doom Guy. While no release date was announced, Doom Eternal is coming to the PlayStation 4, Xbox One and PC sometime in the future. Wolfenstein is another franchise that is making a spectacular return with not one but two new games. The first is a direct sequel to masterful Wolfenstein II: The New Colossus called Wolfenstein: Youngblood. Set in 1980 and 19 years after the previous game, you play as the daughters of BJ Blazkowicz and Anya, who are tasked with finding their father in Nazi-occupied Paris. The second game is a spinoff called Wolfenstein: Cyberpilot, a virtual-reality experience set during the same time and location as the new sequel. Both games are due for the PS4, Xbox One and PC next year. While Bethesda announced Fallout 76 a few weeks ago, the trailer didn’t give us much a go on for what type of game it would be. 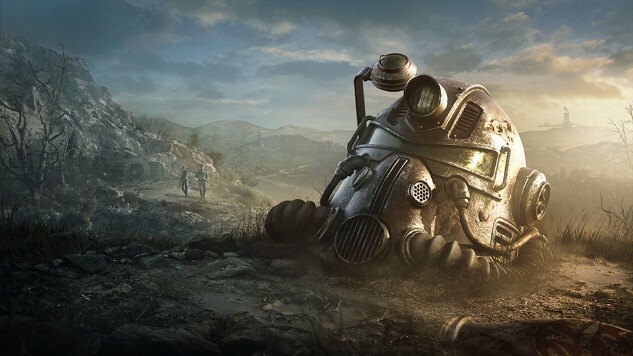 During the showcase, the publisher showed off a new gameplay that featured crafting, making outposts and teaming up with other players to take on the dangerous landscapes of a post-nuclear West Virginia. The game will be entirely online, with other players also being members of Vault 76. However, creator Todd Howard stressed that the game can be played solo. Fallout 76 arrives this Nov. 14, 2018. Fans who were worried that they would be stuck playing Skyrim over and over again can breathe a big sigh of relief, as Howard revealed two new games in the franchise. The Elder Scrolls: Blades is a new game coming to mobile devices and smartphones. It features a gameplay that mimics the traditional Elder Scrolls games. The next game is the next main entry in the series, The Elder Scrolls VI. No further details were given. Starfield will be a brand new game and single-player experience coming from Bethesda. No further details were given about the brand new sci-fi game, but a teaser trailer was shown featuring space, a satellite and what seems to be a huge explosion in the background. Bethesda had a couple of other smaller announcements, which includes the wonderfully weird and very real Skyrim: Very Special Edition for Amazon’s Alexa. Other announcements showed off were Fallout Shelter coming to the Nintendo Switch and PS4, the collectible card game called The Elder Scrolls: Legends, a free-to-play version of Quake Champions, Prey DLC and more content for The Elder Scrolls Online.